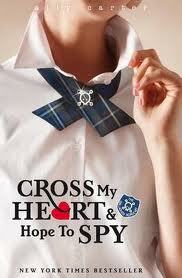 Cross My Heart & Hope To Spy is the second book in The Gallagher Academy series. Set in present day USA, this young adult novel follows teenage girl Cameron Morgan. The story develops as Cameron details her adventures, training as a spy at The Gallagher Academy for exceptional young women. Cameron faces the usual teen difficulties such as classes, homework and exams. Only Cammie’s problems are infinitely more complex than most teens. Starting with classes like P&E (Protection and Enforcement), where the girls learn martial arts, kick boxing and street fighting. CoveOps (Covert Operations), train Cammie and her friends in the art of losing enemy agents, infiltrating secure buildings and countersurveillance. In exams pupils must execute complicated cover stories and obtain classified information. Add into this tangled mix the now sealed off door to the East Wing and its flimsy cover story. Then there’s Cameron’s headmistress, who also happens to be her mother, and keeping family and state secrets. As well as a faculty made up ex-spies and the USA’s most wanted. From all this you begin to understand Cameron’s complicated life. Furthermore what is the mysterious Blackthorne and how can Cammie find out? Are there counterspies in the Academy? Is the clever and frustrating Zach Goode a friend or an enemy? Meanwhile threats to Cammie’s beloved school and the lives of the Gallagher Girls test all her espionage skills to the limit. From the outset with the heroine’s CIA debrief, the author keeps the tension and enjoyment at a high level. Carter’s descriptions and characters well developed and realistic. Cammie is a living, breathing teen girl. She leaps off the page, involving you in her everyday and not so everyday problems. With her witty narrative voice you want to find out how Cammie not only saves her school and her reputation, but also her underwear. ‘Note to self - find out why the Gallagher Academy can manufacture raincoats that double as parachutes, but not a strapless bra that can make it through one covert evening.’ Carter has obviously researched espionage. The use of gadgets such as tiny cameras, lie detection rings, bugs and rappel harnesses help the realism of the plot. Equally Carter’s effortless portrayal of covert operations and spy techniques, such as brush passes, are central to this books appeal. With the plot fizzing along the author still manages to express the ups and downs of Cameron’s emotions with clarity and honesty. All this and the Gallagher Girls’ surveillance reports easily draws the reader into the world of teen intrigue. With traitors, counter espionage, a night-time chase and abseiling into an outnumbered fight, the climax is explosive and fun. This book is for any girl who wants a fast paced entertaining read that doesn’t use vampires, werewolves or lovelorn teens. By the end I defy anyone not to be a Gallagher Girl.